There are many natural wonders to love about the Columbia River Gorge – from the waterfalls, to the rock formations, to the powerful river – it offers nature at its finest. One of my favorite things about the Gorge, though, is man-made: The Vista House. In our latest Flashback Friday, we’d like to showcase this amazing piece of early 20th century construction. The Vista House atop Crown Point with Beacon Rock looming in the background in the smoky haze. Stopping at the Women’s Forum State Park just down the road from the Vista House affords awesome views as well. The 44 foot in diameter by 55 feet in height structure was built between 1916 and 1918 and was funded by Multnomah County and donations from private parties, according to the Vista House website. Edgar Lazarus designed Vista House as an example of modern German architecture, per the website. It has a green roof and features Alaskan marble in the interior. The interior of the Vista House is stunning. 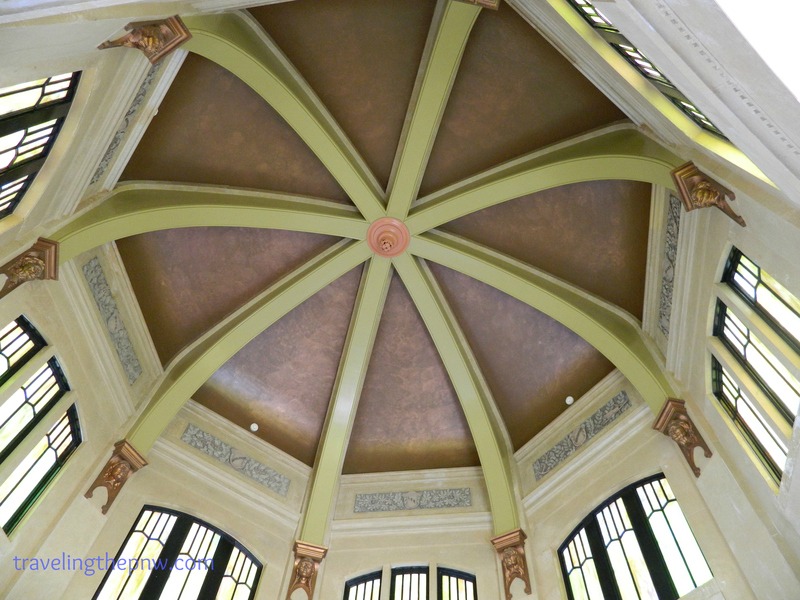 Stained glass windows, Alaskan marble, and this amazing roof. It is a must see if you are driving on I-84 in Oregon. When we went they were doing work on the Historic Columbia River Highway, so you couldn’t drive on the circular drive next to the Vista House. That stretch is open now, though, giving modern day travelers the chance to view the Vista House like their ancestors before them. 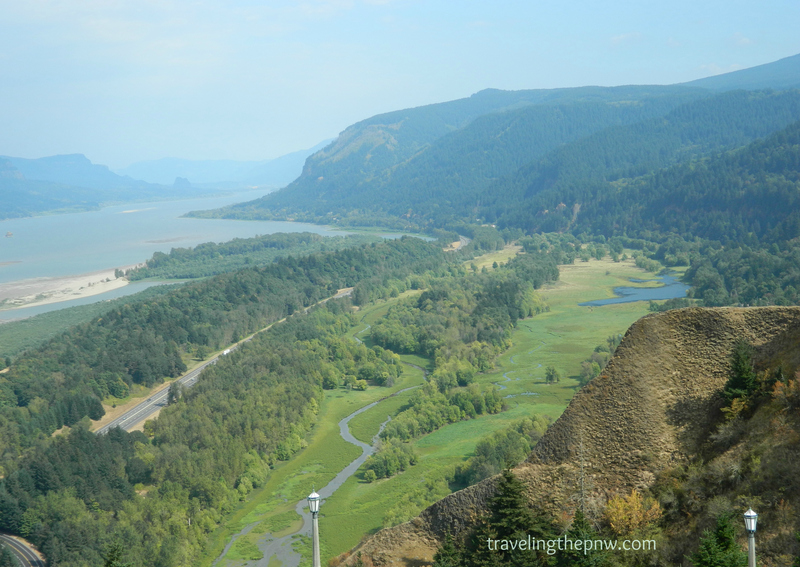 It’s also worth visiting the Portland Women’s Forum state scenic viewpoint down the road from Vista House, which gives you a chance to overlook the Gorge and Crown Point. The views from the Vista House are too good to be true. Here a lush valley and the mighty Columbia River can be seen looking upstream. It’s easy to visit these places and imagine the toil of travelers in the past – be it Native Americans working their way through the Gorge centuries ago to pioneers traversing the Oregon Trail. Man’s construction of buildings like Vista House is only topped by nature’s construction of the Columbia River Gorge, which is one of the most fascinating places on the planet. 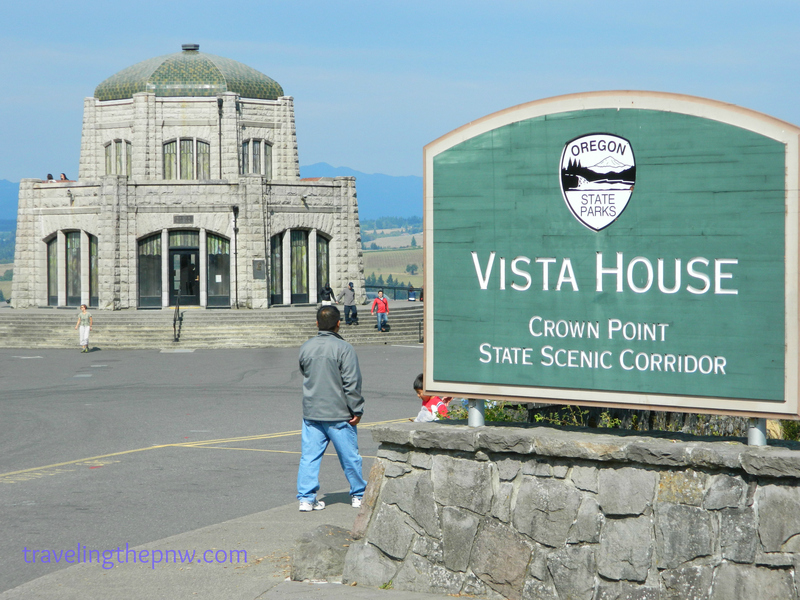 The other thing I love about Vista House is that it is a place for the people – not only is it free, but it offers its stunning views to people from all walks of life and all social classes. As long as you can travel, you can stop and see all that the Gorge has to offer. Why does it seem like I am wearing this Wilco shirt in every photo we ever post? I have driven through large swaths of our country and this is easily the nicest rest stop I’ve ever visited (though I’ve now just had a thought for a new blog post: Best rest stops in the western United States!). 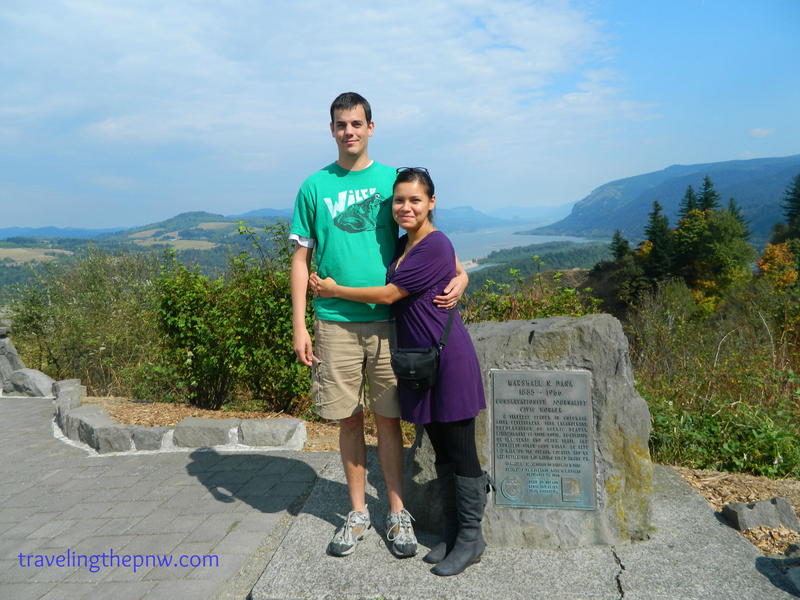 The Vista House is in the vicinity of Multnomah Falls, which is one of the most famous falls in the country. Anyway, the next time you are in the Gorge be sure and stop and look at the waterfalls, but also travel to the top of the 744-foot cliff and visit the Vista House as well. Location: 40700 Historic Columbia River Hwy, Corbett, OR 97019. It is just off of Interstate 84, 25 miles east of Portland. When: Anytime of year, though we went in the fall and the colors were amazing. 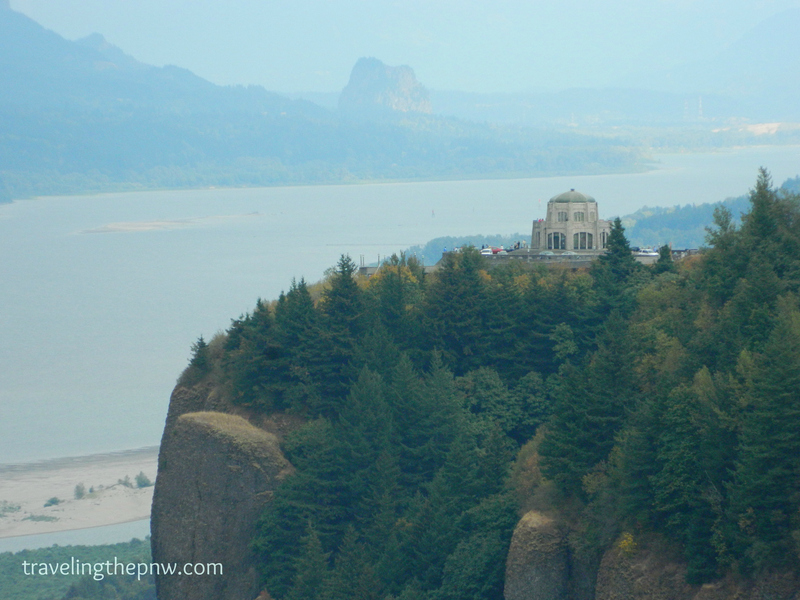 What: Historic rest stop opened in 1918, offering stunning views of the Columbia River Gorge.